OK Go is an American rock band originally from Chicago, Illinois, that is composed of Damian Kulash (lead vocals, guitar), Tim Nordwind (bass guitar and vocals), Dan Konopka (drums and percussion) and Andy Ross (guitar, keyboards and vocals). The band is best known for its often quirky and elaborate one-take music videos, having won a Grammy Award for Best Music Video in 2007 for their hit “Here It Goes Again”. The song “Upside Down & Inside Out” is the third single off their fourth studio album, Hungry Ghosts. The song was released in February 2016, along with the music video, which quickly went viral and accumulated over twelve million views. When you see this title card, you know the video following it is going to blow your mind. The song is about the confusion in the aftermath of a party, and coping with the stress that comes with it. It specifically highlights the problem that arises between two lovers, and how one out of this world night can come crashing back down to a sad reality. The two had an amazing night together but now that the booze has worn off, they’re left with the real versions of themselves and the unknown of who the other person really is. Everything is upside down and inside out because neither of them can tell what is real and what is fake, leaving them confused. These lyrics are paired with psychedelic guitars, off-the-wall synths, and heavily-sampled vocals from Damian Kulash that almost overload the senses with sounds, but somehow work together perfectly. 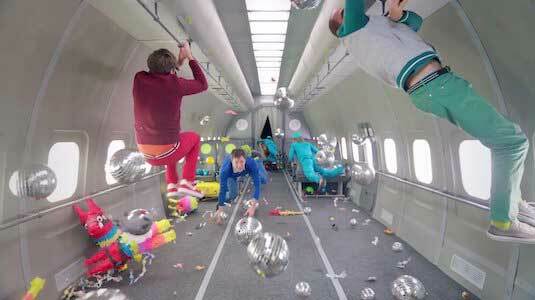 The band actually performed all the flips and tricks in the video while in zero gravity. 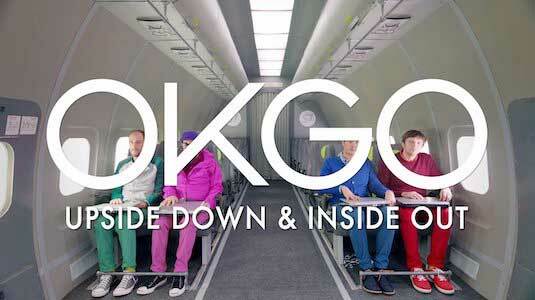 OK Go have set a trend over the course of their careers to go above and beyond when it comes to music videos. They tend to take the concepts of their songs and visualize them through abstract and extremely complex videos. This particular music video takes the concept of confusion and sensory overload, and visualizes it in a zero gravity airplane. The video starts with a title card that says that this video is 100% real, as the band actually went on a zero g plane and performed the stunts live. The band is dressed in bright, bold colors, with two of the members wearing Converse sneakers. Drummer Dan Konopka wears a pair of classic, grey Chuck Taylors, while bassist Tim Nordwind wears a black pair of Jack Purcells. The band spend the music video doing flips, tricks, and throwing things around, creating visual chaos with an assortment of colors, shapes, and movement. The combination of visuals creates an amazing experience that, when combined with the song, perfectly captures the confusion of waking up after a crazy night in the most abstract and fantastic way. Drummer Dan Konopka wears grey chucks throughout the video. Click on the links below to get a new pair of chucks to wear floating in space.